Keltic Lion has been "bred in the purple” as a great sport horse with lineage by the world renowned Sire Lux Z, the world's leading show jumping sire, who competed at the Sydney Olympics & the World Equestrian Games. His Dam, Karigal Lion, is a mare out of the great Eagle Lion family. Keltic Lion was produced in Ireland for Bruce by Patricia Nicolson, who is the number one sport horse breeder in that country. Imported in 2006 as a yearling, he is the only stallion out of the Stream Lion (Eagle Lion’s mother) & the Eagle Lion family. Slideshow of Rocking Horse 2012 Cindy Lawler! Keltic Lion is an outstanding mover with an exceptionally docile disposition. He comes from remarkable jumping bloodlines on both the top & bottom. 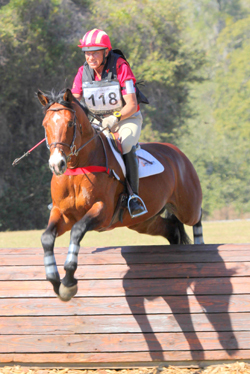 In spring of 2011 he started his eventing career by starting at Training Level & has moved up to Prelim placing 5th at Ocala, and winning at Rocking Horse! He also produced 6 foals in 2009 at Chesterland & has 10 mares in foal for the 2010 season. He has quite a few mares booked for the 2011 season & this is a very exciting young stallion with international potential in all 3 disciplines. Bruce's breeding program is one of the best in the nation. He has been producing top event horses for decades and has devoted most of his life studying the art of horse breeding. Chesterland's landscape offers an ideal atmosphere for raising young horses. The ground is hilly and rich in minerals, where his young stock learn to hone their coordination skills, strengthening their hooves, bones & muscle mass. They are all brought in as 2 year olds to be learn their ground manners & to be backed lightly. As 3year olds they continue their training under saddle, so as 4 year olds they can perfect their jumping skills & begin their competition careers. At the 2009 USEA Convention in Reston, Va., Bruce spoke about his breeding philosophy during his presentation on "Breeding & Preparing the Four Star Horse & Rider". For full coverage & to view this educational video, click here!